An entirely new category of warm drinks for classical Swedish mulled wine brand, Blossa, with a goal to extend the season for warm drinks beyond Christmas. 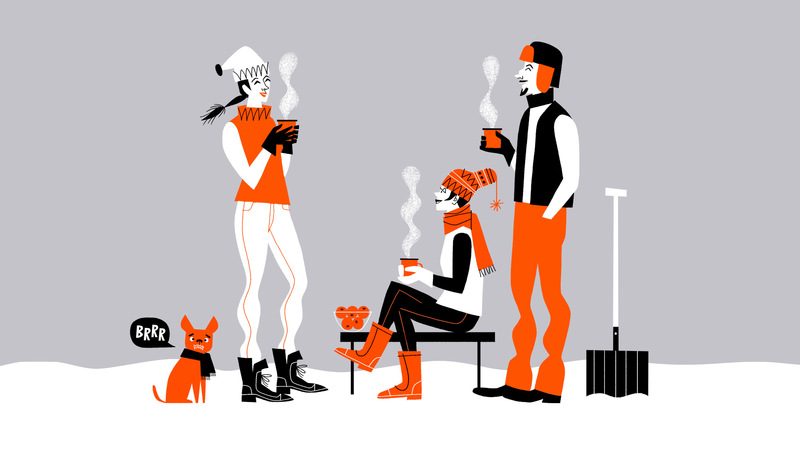 In order to achieve the joyful, communal spirit of the drink, we worked with illustrations depicting people engaged in outdoor, winter activities. The illustrations are done in collaboration with Klas Fahlén. 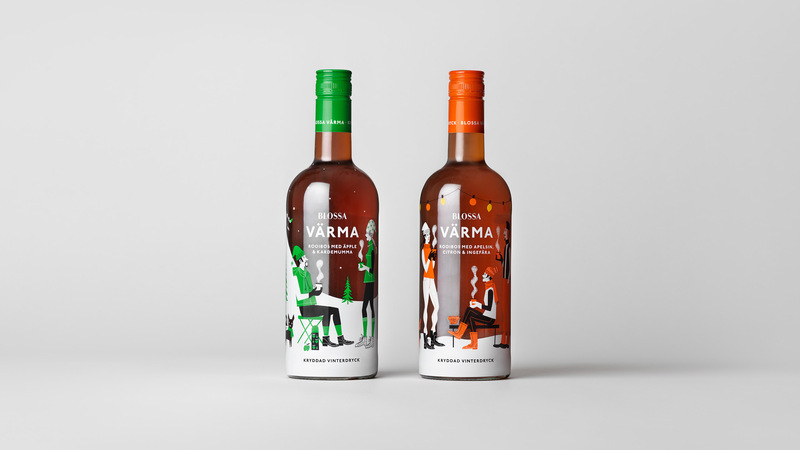 Blossa Värma is a non-alcoholic beverage based on rooibos tea, carefully selected spices and different fruit juices. It comes in two flavors; citrus-ginger and apple-cardamon. 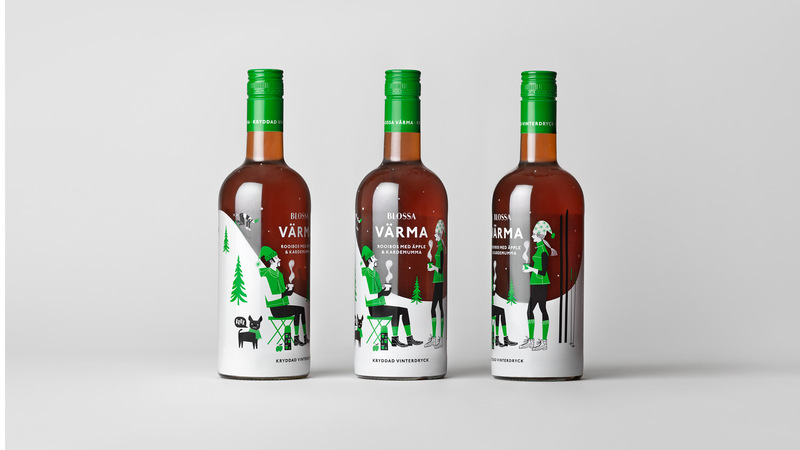 The design covers the entire surface of the bottle for optimal shelf stand-out, allowing the illustrations to wrap around and tell the story of the winter scenes. The product variants are differentiated through simple colour coding. The market for glögg, a special kind of mulled wine strongly associated with Christmas in Scandinavia, is stagnating. Conceived in 1895, Blossa is considered the original glögg brand and has a market share of around 70% in Sweden. Checking all the boxes when it comes to awareness, likability, credibility and quality perception, Blossa’s brand management wants to capitalize on these assets and expand the glögg-drinking season to make Blossa a household name not only in December, but throughout the whole winter season. 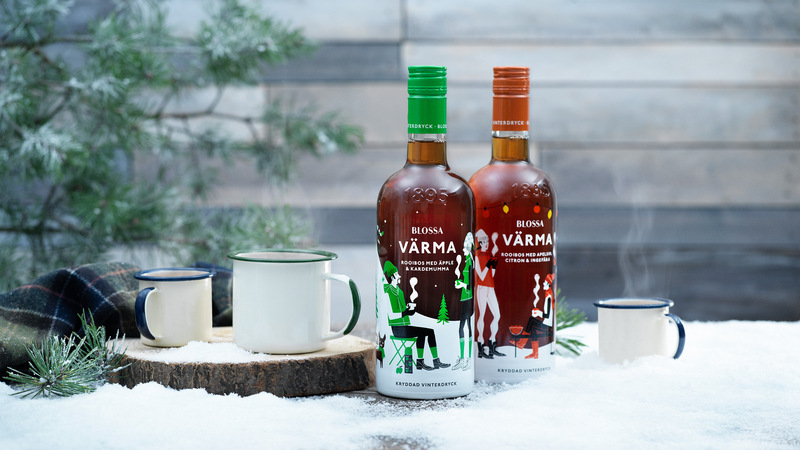 What if the brand could widen its associations with just ”glögg” to encompass ”a warm, invigorating drink to be had in moments of joy and togetherness” – regardless of the season? 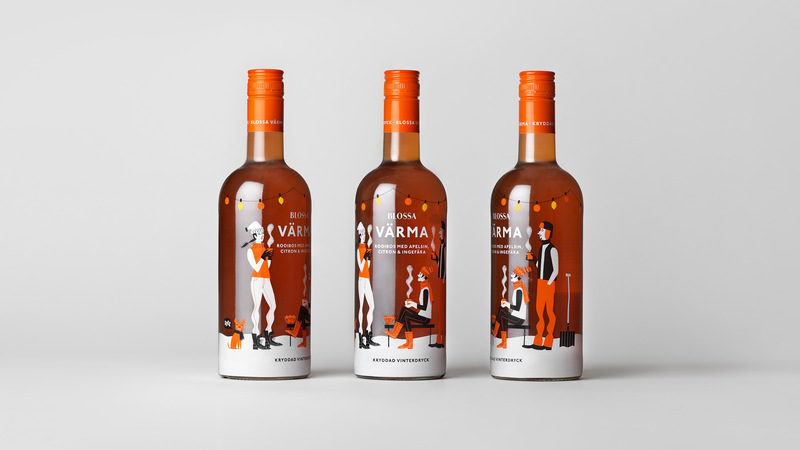 Blossa Värma is a non-alcoholic beverage intended for the retail market, based on rooibos tea, carefully selected spices and different fruit juices. It comes in two flavors, citrus-ginger and apple-cardamon, and is meant to be lightly heated and either consumed immediately, or put into a thermos or flask and brought outdoors. The Studio was given the task of coming up with the name, the story on the label and the packaging design. The main challenge was to make consumers understand that although this is a Blossa product, it is not glögg (since that has a specific taste that Scandinavians only drink in the weeks leading up to Christmas). 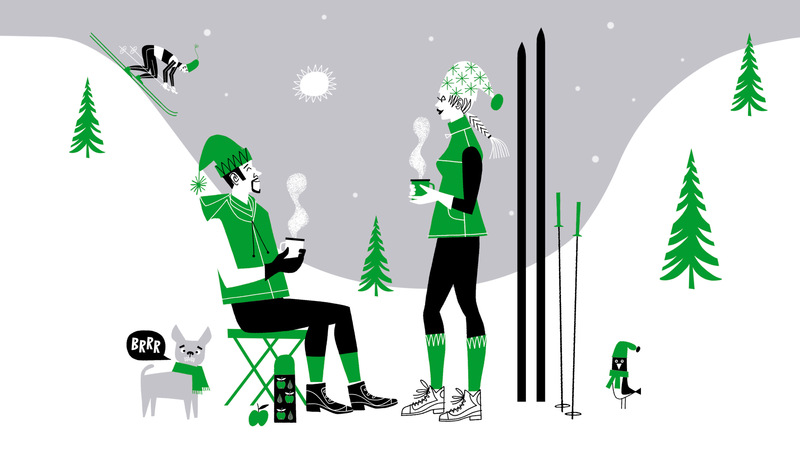 In order to achieve that, and to communicate the joyful, communal spirit of the drink, we steered away from the classic Blossa Glögg design and instead opted for using illustrations depicting people engaged in outdoor, winter activities. 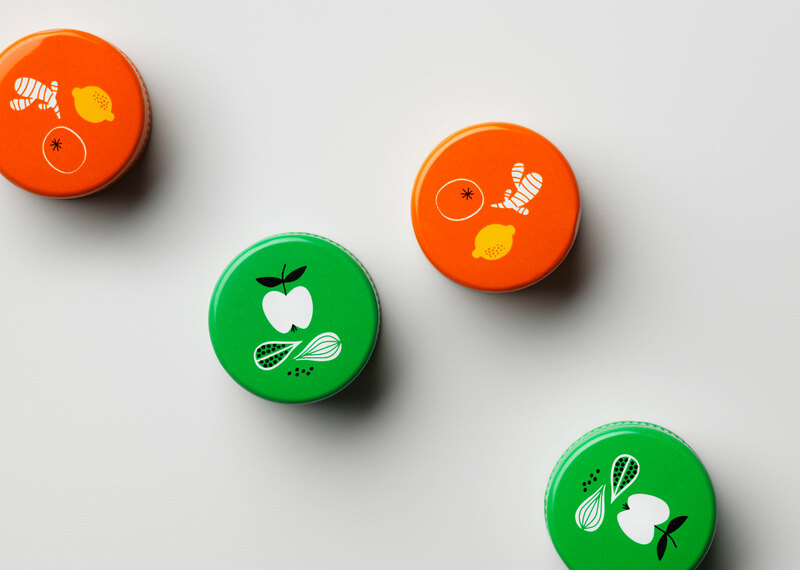 The illustrations are done in collaboration with Swedish artist Klas Fahlén and the two products are colour-coded according to their main ingredients (citrus and apple). There is a kinship maintained with the Blossa design through the subtle use of Blossa’s primary typeface.